More than 50 prospective students got an up-close look at what it would mean to be a part of the University of Michigan-Flint at the annual Experience UM-Flint Admitted Students Event. 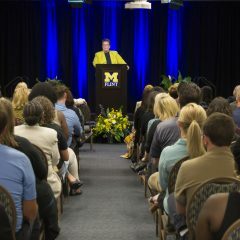 The event was open to all students who have been admitted to UM-Flint as an opportunity to answer any last questions and give them an in-depth look at the university before they make their final decision about what school they will attend in the fall. 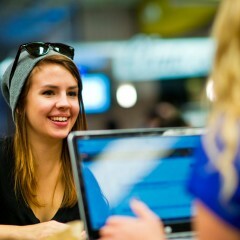 After an ice breaker and orientation, the prospective students—some who’d already made up their mind to attend, others who were still on the fence—broke into a series of sessions on topics including living on campus, student leaders on campus, meeting with the deans and faculty of various departments, and university outreach. The day wrapped up with different specialized tours of campus. Prospective students could pick from tours of the music or theater department, various science labs, the School of Management, First Street Residence Hall, or a tour of downtown Flint. Zak Harwood plans to attend UM-Flint next fall. The experience was enough to convince Henry Vargo that UM-Flint was the school for him. 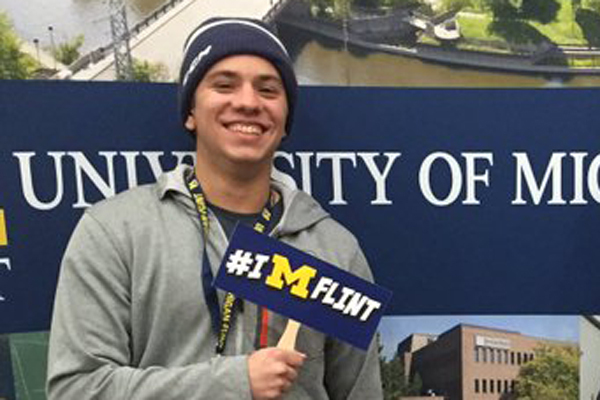 The Saginaw native said he’d toured other colleges he’d been accepted to, and that he was pretty sure that UM-Flint was school for him, but the event made him even more confident in his choice. One thing he said he was particularly impressed with at UM-Flint was its diversity. “It’s a very fun day,” said Vargo, who plans to live on campus in the fall. He said he plans on being involved in music and likely some field in science, possibly biology.